About – Cherry City Plumbing, LLC. Our company has been proudly providing fast, friendly, reliable service in the Salem area since 1983. Our crews are radio dispatched, so whether it’s a plumbing emergency or regular maintenance, we pride ourselves in prompt service. From leaky faucets to broken pipes, a new water heater or a new waterline, we have the expertise. 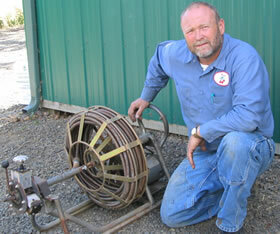 We handle both residential and commercial plumbing and drain cleaning services. Depending on the project, our crew uses a variety of precision tools and powerful equipment including the sewer TV camera, backhoe, excavators, hydro jetter and a hydro vac unit. We serve customers all over the Willamette Valley area. You may have seen our service vehicles anywhere from Wilsonville to Corvallis, Detroit to Lincoln City. Just watch for our logo with the bright red cherries. All our trucks have GPS Units for quick arrival times, saving our customers money. We are full service plumbing and repair specialists, and a women/minority contractor.